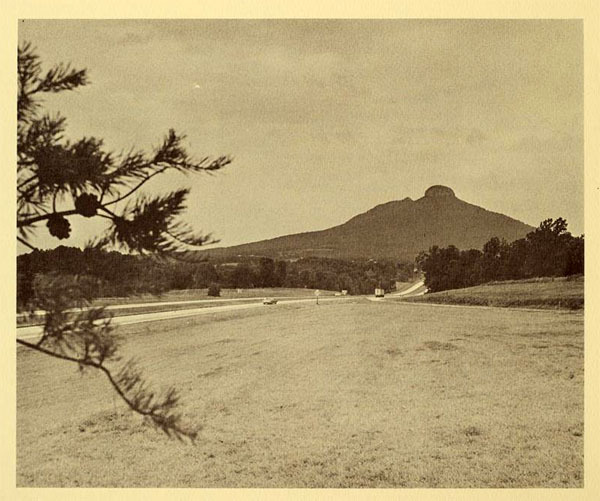 Like the rocky escarpments in nearby Hanging Rock State Park, Pilot Mountain is a remnant of the ancient Sauratown Mountains. A quartzite monadnock, this rugged mountain rock has survived for millions of years while the elements have eroded surrounding peaks to a rolling plain. Pilot Mountain is capped by two prominent pinnacles. Big Pinnacle, with walls of bare rock and a rounded top covered by vegetation, rises 1,400 feet above the valley floor, the knob jutting skyward more than 200 feet from its base. Big Pinnacle is connected to Little Pinnacle by a narrow saddle. Visitors have easy access to the top of Little Pinnacle where the view encompasses hundreds of square miles of the Piedmont and the nearby mountains of North Carolina and Virginia. The mountain was mapped in 1751 by Joshua Fry and Peter Jefferson, father of President Thomas Jefferson. Pilot Mountain became North Carolina's 14th state park in 1968, due in large part to the efforts of a group of local citizens. Prior to that time, the mountain was a commercial tourist attraction. The Pilot Mountain Preservation and Park Committee proposed the establishment of Pilot Mountain as a state park in order to protect it and the surrounding area from further commercial development. Working with the conservation-minded owner of the property, Mrs. J.W. Beasley, the group secured options on the land and raised matching funds that made it possible to purchase the land with federal grants. In further support of the park, the committee acquired more than 1,000 acres of land along the Yadkin River that were added to the park in 1970. Additional acreage was later acquired, bringing the park to its present size of approximately 3,700 acres. The Yadkin River section of the park surrounds a portion of the river and is located to the south of the Pilot Mountain facility. The Horne Creek Farm state historic site is located on land adjacent to the north eastern corner of this section of the park. The farm is currently being restored to appear as it did in 1900, with an educational center dedicated to preserving North Carolina's rural heritage. North Carolina Division of Parks and Recreation. Pilot Mountain State Park. http://www.ncparks.gov/pilot-mountain-state-park (accessed December 8, 2015). Resources on Pilot Mountain State Park, North Carolina Digital Collections, http://digital.ncdcr.gov/cdm/search/searchterm/pilot%20mountain%20state%... (accessed December 14, 2015). Resources related to Pilot Mountain, Digital Public Library of American, http://dp.la/search?place%5B%5D=Pilot+Mountain+%28N.C.%29&q=pilot+mounta... (accessed December 15, 2015). Dunn, David E., and Peter W. Weigand. 1969. 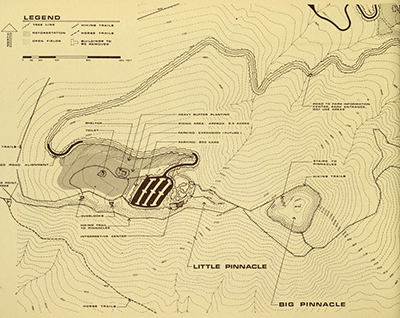 Geology of the Pilot Mountain and Pinnacle quadrangles, North Carolina. [Raleigh]: North Carolina Dept. of Conservation and Development, Division of Mineral Resources. Hatcher, Robert D. 1988. Structure of the Sauratown Mountains window, North Carolina. Raleigh, N.C.: Carolina Geological Society. North Carolina Division of Parks and Recreation. Pilot Mountain State Park Master Plan. 1970. https://archive.org/stream/pilotmountainsta00unse#page/60/mode/2up (accessed December 30, 2015).